Last night I almost made the party – the Twitter party, that is. 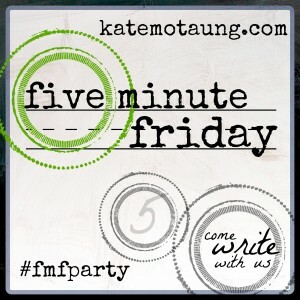 When the Five Minute Crowd gathered at Kate’s from all over the globe, chatted a while, caught up with news, and then with anxious eyes waited for THE word. The point is I didn’t make the party, darn it! Yesterday morning I was out in the yard mowing by 6:15 and last night at 10 o’clock when the FMF mob came together, guess what I was doing? The very moment I saw that word I thought of my favorite childhood story, Charlotte’s Web. I love everything about that story except of course when Charlotte dies. UGH. I digress. In chapter 16, Mr. & Mrs. Zuckerman are preparing to take their prized, intelligent pig to the county fair – the night before they are to go Mr. Z has a DREAM. He dreamed that Wilbur won so many blue ribbons and his farm became famous! In fact, all the characters were having dreams that night! Off they went to the county fair. Mr. & Mrs. Zuckerman, Wilbur’s crate, along with Charlotte and Templeton. Of course, Fern went but she was more interested in Henry Fussy than anyone or anything else! The night before the big judging, Charlotte hears whispers of Wilbur’s name being associated with bacon, ham, and sidemeat so she knows she has to do something clever for her friend. She sends Templeton out to find “words” – lo and behold he comes back with some scraps on which HUMBLE is written! 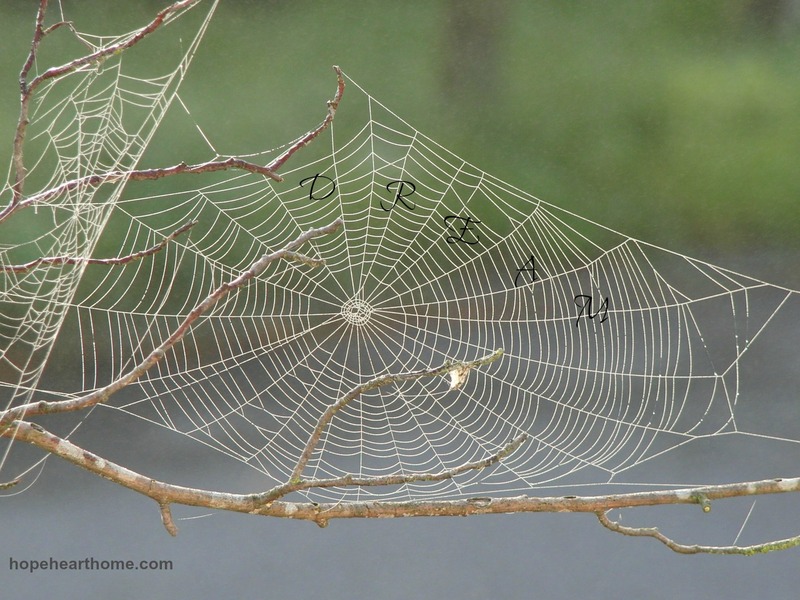 Charlotte works her magic over Wilbur’s pen and weaves HUMBLE into a web. All the visitors at the fair went nuts over WILBUR THE HUMBLE PIG! The next day Mr. Zuckerman’s dream comes true and Wilbur wins a blue ribbon and $25! But, as this dream is coming true, a very sad event is happening – Charlotte is dying. Wilbur loses his very best friend but is devoted to keeping Charlotte’s dream alive by watching over her egg sac. The story has a happy ending for Wilbur as he watches all of Charlotte’s offspring float off into the wind – he kept his promise to his best friend! I believe dreams are God-given and just like this delightful children’s story sometimes a lot of other things have to happen before one sees the fulfillment of a dream. Like Wilbur, we must be devoted and diligent – humble and “near the ground” (ch. 18 of the book – wouldn’t that preach?). I believe dreams are God-given and just like this delightful children’s story sometimes a lot of other things have to happen before one sees the fulfillment of a dream. I’m sorry you missed the party (aren’t those kinds of things fun?) but it seems like missing the party lent itself to this post and I’m grateful because I needed to read this! Shelby – oh I am so very glad to hear this! Lisa, thank you for visiting – I won’t allow myself to stop dreaming! Thank you for reminding me that my dreams aren’t stupid. NO dream is stupid! I’d love to have watched that production, Marie. Ah – Charlotte! I love that story too! Reading this post was like getting a visit from an old friend! Happy Weekend! K – glad to stir a memory! web right away. I meant to pop on Twitter last night too for the FMF party. But I was watching a show with my husband. I usually dream by nine or ten too! Dreams do come true in special God ways. Jenn, glad you dropped by. Another morning person? Charlotte’s Web is one of my favorite stories. Whenever I read it to my classes (MANY years ago! ), I always cried when Charlotte dies. So sad. I loved how you wrapped this post up. We need to stay humbled and near the ground, just like Wilbur. It’s when we’re in that place of humility that God can do His thing. Thanks for sharing these thoughts! And thanks for visiting my blog. Jeanne, yes! Thank you for coming over! I needed this encouragement today. I love that story and I love the way you have so eloquently tied it into God’s truth. Thank you! Natalie, hope everything’s okay. I can’t think of much that cannot be tied into Him!!! Ah yes, Wilber the humble pig! I love it! Love the story, love the summary, and LOVE your graphic, girlfriend! As I read through I thought to myself, “how is she going to make it to the end in five minutes? !” haha! Gigi, so glad you “checked” in!!! Ah Susan, thank you! You know I took my son to see Charlotte’s Web sometime either before of after my cancer surgery. It all seems like a blur, but I remember, thanks to your post, seeing the word “humble” and that really got my attention during the play and was just another confirmation on using the name, humble and bold, which is now a dream come true! Amen, Christina – beautiful testimony! I love Charolotte’s Web! Actually found a really great copy at a garage sale the other day. My daughter is in first grade and I need to put that on the reading list for this summer! Thanks for sharing. Oh yes, Christian, she is ready!!! Well, you know the dream I share with Wilbur. And, I share it with you, brother.